If you have not used recently or at all, the FamilySearch online site or the material at any local Family History Center operated b the Church of the Latter-Day Saints, you are missing a golden opportunity. The FamilySearch.org is always adding to its collections. Just the United States collections number 1,114 with titles such as: Alabama Deaths 1908-1974 (1.8 million records), San Francisco Passenger Lists 1893-1953 (1.2 million records), Illinois State Censuses for 1855 and 1865, Bath in Maine-seamen’s proof of citizenship 1833-1868, Massachusetts Town Records 1638-1961 and NYC-Ellis Island arrivals 1892-1924 (24.5 million records). As you research this treasure chests of records, go beyond the towns and states you think an ancestor lived in. There could be some places or ancestors in locations you were not aware of to date. 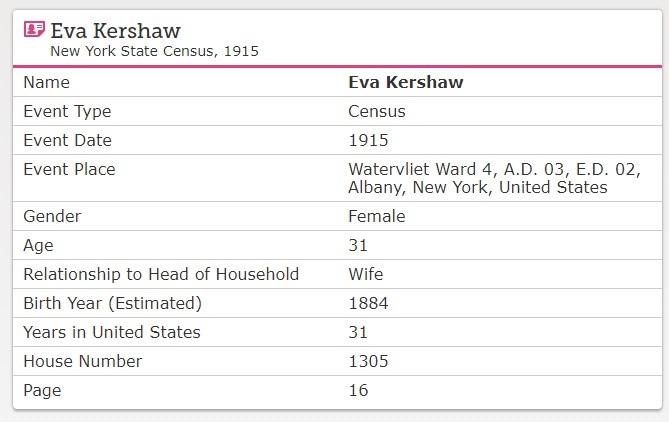 An example, my maiden surname is ‘Kershaw’ from Massachusetts, not a common name in America. 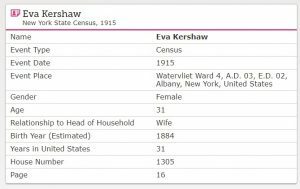 But checking the 1915 NY State Census I located 693 individuals named ‘Kershaw’ in New York. It can be of great benefit with several of the older original American colonies such as New York, Pennsylvania, or Delaware to explore their marriage, death records with many dating back to the 1700s. You can explore the collections for countries besides the United States. Just click on the collection of interest to the left. New collections added each month. If you have not researched the FamilySearch collection in a while, make some time to do so. Bookmark the site. Photos: Eva Kershaw in NY 1915; Alabama Union Service Record 1863 for Alex J. Johnson; and 1791 marriage of Lovey Wilson and Abram Harris in Delaware.